Persian city; 160 miles west-southwest of Teheran. Hamadan is generally identified with the ancient Ecbatana, the Achmetha of the Bible, capital of Media Magna. It seems that the Jews settled there soon after its foundation and prospered; but with its conquest by the Arabs (634) persecutions began. Benjamin of Tudela, who was there in the middle of the twelfth century, makes the statement that he found there fifty thousand Jews. From the following remark of Edrisi, also, it is evident that the city was inhabited by a great number of Jews: "The commerce of this place was very considerable, which accounts for the great number of Jews it contained." Later, under the Sufi and Afghan dynasties (seventeenth and eighteenth centuries), the Jews of Hamadan suffered heavily. The Judæo-Persian poet Babai b. Luṭaf of Kashan described in verse the persecutions of the Jews throughout Persia under Abbas I. (1595-1628), Abbas II. (1639-66), and under the first kings of the Afghan dynasty. The Jews of Hamadan suffered especially at the hands of Mohammed Bey, the fanatical vizier of Abbas II., who gave them the alternatives of embracing Islam or of leaving the country empty-handed. Those who refused to do either were put to death. The offer of rich rewards for apostasy occasioned a considerable number of conversions among the poor Jews. Maḥmud Shah (1725) massacred a great number of Jews, among them being the rabbi of Hamadan, Mulley Musa. Another massacre occurred by order of Taḥmas Kuli Khan, better known as "Nadir Shah" (1735-47). "The Jewish colony lives in a special quarter in the midst of the town, in a ghetto. Their sanctuary is a small monument, built in the shape of a dome, and, according to tradition, contains the tombs of Mordecai and Esther. The Jews earn their living by all kinds of gold- and silver-work, in which they are as clever as the Caucasians; by glass-cutting, silk-weaving, dealing in old clothes and in skins. Many of them are masons, blacksmiths, tailors, and shoemakers; some practise medicine, which they study according to the works of Avicenna, who is buried at Hamadan. They live under great difficulties, because they are considered as outcasts; they are constantly exposed to the caprices of the governor, who uses every pretext to plunder them. . . . Should a Jew appear in the street dressed decently, or on horseback, the spectators are indignant at him for daring to appear like a true believer. Should he, on the contrary, be dressed miserably, he is followed by a crowd of young rascals, who throw mud and stones at him." 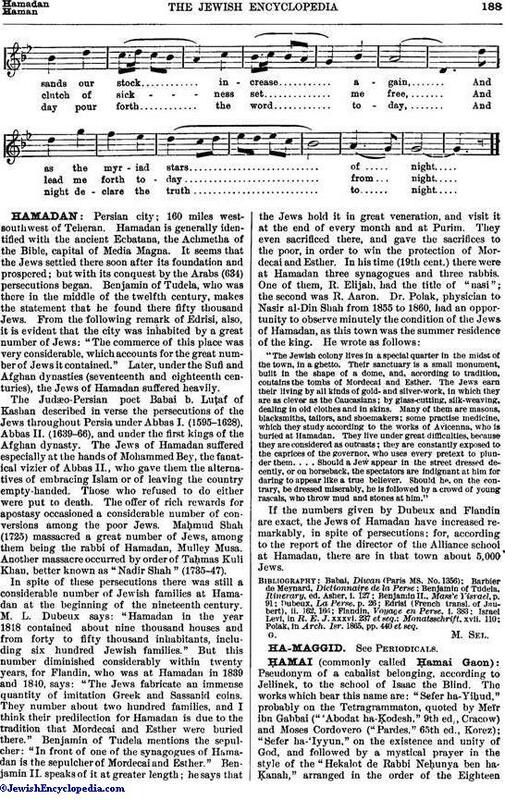 If the numbers given by Dubeux and Flandin are exact, the Jews of Hamadan have increased remarkably, in spite of persecutions; for, according to the report of the director of the Alliance school at Hamadan, there are in that town about 5,000 Jews. Polak, in Arch. Isr. 1865, pp. 440 et seq.